Varicose veins can be annoying, embarrassing and uncomfortable — but manageable with self-care measures. Sometimes, though, their symptoms can signal serious medical problems that warrant a health care professional's attention. 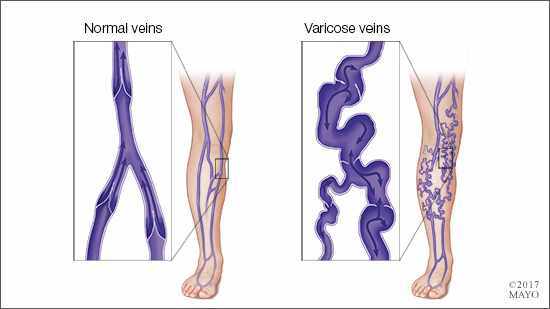 Do you know the causes of varicose veins and when you need to seek medical care? Your bones do more for you than you may realize. From giving you the structure and support you need to breathe and walk, to protecting your organs and playing an important role in the endocrine system, healthy bones are important for good health through your lifetime. Learn what you can do to ensure your good bone health. Stretching can increase flexibility and improve your range of motion, helping you move more freely. And equal flexibility on both sides might help protect you from injury. Do you include stretching in your exercise regimen? In the early stages of Alzheimer's disease, caregivers often focus on keeping loved ones safe and comfortable. As the disease progresses, however, you might face difficult end-of-life questions. Among the most profound are decisions that ensure respect, dignity and physical comfort until the end of life. Here are come ideas to consider as you prepare. Safety is an important consideration when it comes to children and water play. Before you help your child suit up, consider these practical year-round tips from Dr. Jay Hoecker, an emeritus Mayo Clinic pediatrics specialist.